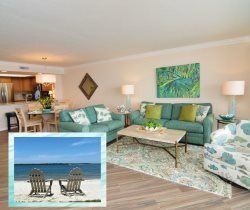 Enjoy this Sanibel Harbour vacation rental’s spectacular Gulf & beach views from the 2nd floor, and watch sunsets every night on your screened-in balcony. This well-appointed Resort Harbour condo offers appealing Florida-style decor. The cool, earthy tones and granite countertops are reminiscent of the sandy beach outside, bringing a touch of nature into the living space. It also provides a variety of modern upgrades, such as a HD TV with a Bose sound system, DVD player, Apple TV, huge movie collection and computer, printer, fax and scanner for your use in the living room. Both bedrooms also have a HD TV with Apple TV and an Xbox 360 with games. With a king bed in the master bedroom and a queen bed in the guest bedroom, there is plenty of space for everyone to enjoy their vacation. had to make a call to maintenance regarding the kitchen faucet not working, the staff came right on up right away and were able to fix it, fortunately it was an easy fix.